We all love fonts/typefaces, so why not put fonts into a scientific-all form? That is what Squidspot did. 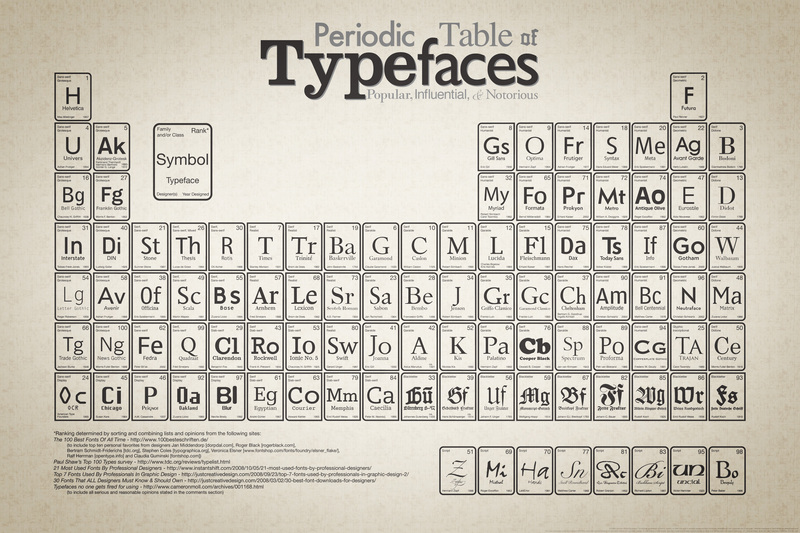 They created a Periodic Table of Typefaces. It is really well thought out and genuinely well created. I have some information about the Periodic Table below and how you can get your hands on one. You have to get one! Unfortunately, the typefaces could not be sorted exactly numerically on the table while at the same time keeping them in groups of families and classes. It had to be one or the other. Of course it COULD have been done but I would have had to seriously sacrifice aesthetics of the overall design (i.e. it wouldn’t have come out looking AT ALL like a traditional periodic table.) However, upon close inspection, you find that at least the typefaces are ordered within their family/class groupings.